The Mind Museum Presents the Science Circus: Step Right Up! - Triple Joys!!! The Mind Museum Presents the Science Circus: Step Right Up! Ladies and gentlemen, the Science Circus has come to town! 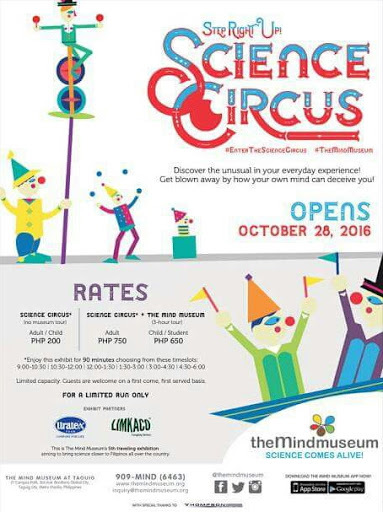 MANILA, Philippines - Science Circus: Step Right Up! is the latest traveling exhibition of The Mind Museum, showcasing the amusing, the peculiar, and the extraordinary in our everyday experiences, in the form of interactive exhibits thatdeceive the senses and boggle the mind. Be ready to #EnterTheScienceCircus this coming October 28, 2016! circus by focusing on the mind’s "acrobatic" perceptual tricks. As the guests enter the exhibition, they are welcomed by a festive, colorful façade which sets the tone for the sights and sounds they are about to experience. These interactive exhibits are displayed simultaneously in three adjacent Rings. Guests can go in any of the Rings in the order they please. Ring One, or Deception Perception is a menagerie of exhibits that will prompt you to question whether to see is to believe. Can you always trust your senses? Is what you see as real as it seems? Can your brain produce motion where thereis none? Your first venture into the Circus will unveil the "blindness" of your mind’s eye. Ring Two highlights Pieces of Incredible Engineering, where guests can engage their minds in puzzles and relish how math and art come together. This central area is animated by simple machines, and engages guests in activities that evoke their inner engineer. Last but not least, Ring Three is Encounters with the Masters, where guests can interact with and learn the secrets of the Masters of Illusion. They can take on the challenges posed by each Master, and discover how our brains can be ensnared by smoke and mirrors. The Science Circus: Step Right Up! exhibition vividly illustrates how our everyday experiences are full of delightful secrets that we can uncover, to discover more about ourselves and the world around us.